A camping tarp is an incredibly useful piece of gear, second only to your tent. On that note, if you need help choosing a tent, we have a great list of our favorite pop-up tents for you to take a look at. Tents and tarps go hand-in-hand and are an extremely effective pairing for any camping trip. No matter the conditions or difficulty level you plan to take on, a tarp will provide comfort and utility in all situations. 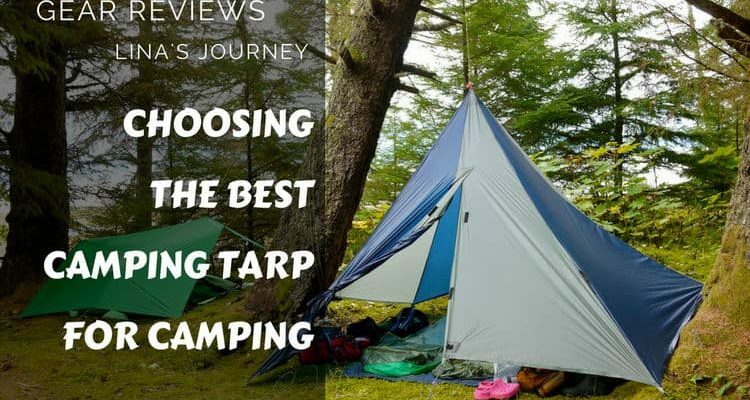 We aim to break down what you should look for when purchasing a tarp and review a few of our favorites to help you choose the best camping tarp. In addition to tarps, tent footprints are another useful addition to you kit. Check out our tent footprints vs tarps article here to see just which is best for you. Now let me show you top 4 best camping tarp with editor rating. This is my favorite tarp in our list. It includes everything you can possibly need and is able to cover any situation with no difficulties. Its hardy design makes it a perfect accessory. Furthermore, its lightweight design allows you to easily carry it long distances over rough terrain with no added strain made from Diamond Ripstop nylon, this tarp isn’t going to wear down anytime soon. Its design also helps to protect against both tears and punctures, making it ideal for harsh environments. It also features a rain-proof carrying case, allowing you to stay dry no matter what. With multiple ties and an immense, 203-inch centerline, this tarp can be pitched any number of different ways, doubling as a hammock if needed. A 12’ span means it is suited for all uses and can easily cover any tent or tarp setup, proving maximum protection. This is a tarp that I can definitely see myself using when camping in any environment and is a close runner up to my favorite, the Chill Gorilla 12’ Tarp. The Gnarwhal Gear Tarp Shelter is sturdy and durable, capable of taking on any challenge. This heavy-duty choice is a must for any camping situation. Campers use it as a hammock or shelter and span an impressive 12 feet across. This size allows you to use it for anything from backyard camping to outdoor survival expeditions. Like the Chill Gorilla tarp, it comes with stakes and is made of durable material, helping you to avoid wear and tear. This setup is almost as good as the Chill Gorilla, earning it a spot in our Top Picks. It is large and strong enough to offer protection wherever you may need it. The corners are reinforced and include corrosion-free grommets, which puts this tarp at the top of the pack when it comes to standing up against the elements. Lightweight and infinitely portable, this tarp measures 10x9.5 feet and weighs around 1.6 pounds. It isn’t fully waterproof, but is incredibly water-resistant and will hold up to most showers. While not meant for heavy-duty camping, this tarp’s appeal is in its price tag. It comes with ties and sturdy pegs, allowing for easy setup wherever you may be. I think this tarp is perfectly suited to backyard or beach use. It offers basic protection when you need it and is made of Ripstop nylon, meaning it will last for ages, even with regular use. While not suited for expert level camping or backpacking trips, this tarp is great for anyone looking to set up a cheap and cheerful shelter with minimal fuss. Easy on the wallet, this tarp also comes with a 3-year warranty. Ideal for all environments and conditions, this tarp reigns supreme. Specifically built for camping, it doubles as an actual tent, completely enclosing you while protecting you from harsh sun and heavy rain. The overlapping doors make getting into and out of this shelter incredibly easy. This shelter is so much more than just a tarp and is a camper’s best friend. The silicon-impregnated material will even keep in the heat during the winter. This tarp is also designed to sit over a hammock, completely enclosing it while keeping you warm and dry. No matter what conditions you expect to encounter, with the Eno Eagles Nest Outfitters HouseFly Rain Tarp you can head out knowing you’re completely covered. Setup is a piece of cake, leaving you to focus on more pressing matters, and the tarp comes with a waterproof pouch for storage, just in case. This is a small shelter designed to work in a pinch. It’s not all that large, so isn’t geared towards big groups, but a solo or duo hiking team will get some good use out of it. Small and light, the Kelty Noah’s Tarp Shelter will keep the sun off your back when you take a break for lunch. It is water-resistant, protecting you from light rain, but will not stand up to heavier showers. The real benefit here is that this tarp is quick and easy to assemble without any hassles. It is also small enough to fit into any pack and is ideal for any amateur on a day hike. This tent is a cinch to assemble and is durable enough to stand up to whatever your kids will throw at it. The pegs are brightly colored, making them difficult for children to lose, although you will want to supervise younger children because they are made out of aluminium. The basic design is easy for any level of camper to figure out with no worries, with the waterproofing keeping you dry even in a downpour. Its tear-resistant material will actively prevent tearing or punctures, so you don’t have to worry about your kids making a mess of things. Another beast of a tarp, this solid choice is one that will offer complete protection, even in miserable conditions. This polyester tarp is sturdy and will not damage easily, even with extremely heavy use. It is easy to assemble and comes with its own set of stakes and lines. It is large enough to support any camping needs and is completely waterproof. If you’re looking for a quality tarp for a group of campers that will last for a long time, this is the one you should absolutely consider. It even features a 30-day return policy, no questions asked. I’m sure you’ll find it suits any outing perfectly, whether it be for the day or longer. When you need a simple tarp, without any of the added bells and whistles, the Hammock Tarp by The Outdoors Way has your needs in mind. It is built to last, with enough width to cover any number of campers without worrying about cramping. It is incredibly easy to assemble and can be pitched just about anywhere. It offers complete rain protection and is made out of Ripstop nylon. If you just want a quick and easy solution, the Hammock Tarp will suit you perfectly. A day out at the beach doesn’t need to end in a sunburn. Furthermore, you can also protect yourself from heavy rain, if showers do happen to pop up. This all-around protection is exactly what Unigear’s Hammock Rain Fly offers you during your next beach trip. The solid Oxford fabric prevents tearing and punctures, as well as protecting your tent from wearing down after repeated use. This tarp is even ideal for more heavy-duty camping situations, but is tailored perfectly to beach use, with the double-edged stitching keeping everything together no matter what. The only downside to the Unigear Hammock Rain Fly is that the stock stakes aren’t perfectly suited for beach use. They are somewhat small, which makes it harder to get a solid purchase. That being said, they do work just fine in most cases. If heavy wind is expected, additional stakes might be needed. If you require an all-around camping tarp that can still be tailored to other situations, the YUEDGE Portable Lightweight Waterproof tarp will suit your needs just fine. It is of a durable design and offers all the protection you need from a good tarp. It is easy to assemble and break down, allowing you to pitch it in seconds. Furthermore, the stakes that come with the YUEDGE are high quality and will keep their purchase in any conditions. The YUEDGE’s fully waterproof material is also incredibly lightweight, making this a tent that you can carry around solo without adding any extra weight or taking up space in your pack. Most intermediate campers will benefit from the YUEDGE, with most beginners able to take advantage of it as well. Expert campers might opt for something a little more dedicated to overnight trips, but even they will admit that the YUEDGE is impressive. Take these tips on choosing just the good quality tarp that is sure to provide you comfort and protection in your camping. These tarps are good for any type of trip and are by and large the most popular style. Whether you plan on heading to the beach with the kids or you want to do some serious camping, these will always fit the bill. They are good, well-rounded tarps, with all the features we expect from quality tarps, with some coming with many added features. Most, however, are of a relatively basic design. All-purpose tarps will usually come complete with lines and stakes for easy setup, but some do come standalone, with accessories sold separately. They are durable and able to stand up to the elements, with most being made of exceptionally durable material. Not quite as durable as ground tarps or insulated as tent tarps, they can easily be adjusted to suit any specific needs. If you require a tarp you can use in any situation this is the type you’ll want to look into. Additionally, if you’re not sure exactly what you’re going to need, these will always be good bets, able to stand up to punishment and still be versatile enough to allow for some adaptability. If flexibility is important to you or you hope to cover all your bases then an all-purpose tarp should be your go-to. Many campers enjoy these tarps as they can be adapted to whatever conditions are expected during a given trip. This style is mostly used at beaches or picnics in order to help avoid making a mess around food, for example. They are, once again, fairly well-rounded, but are mostly suited for ground use. These will come in handy during day trips, but fall short of covering any overnight needs. These tarps don’t feature grommets or ties of any kind, making them a hassle to use while camping for any length of time. Furthermore, they tend to be heavier to stop them from being punctured when on the ground, making them harder to carry on long trips. Their size also makes them more difficult to stow as they take up so much more space. Ground tarps do have waterproofing built in a lot of the time, but aren’t always completely waterproof. If this isn’t a concern of yours, then it’s no big deal, but if you do want water-resistant material it is worth looking into before purchase. Ground tarps are very versatile, but planning and additional equipment is required if they are to be used for any other purpose. Families will benefit from these tarps, but they will usually fall short of including basic camping requirements in their design. These tarps are the ones that you’re going to want if you’re doing any kind of outdoor camping, especially overnight trips. They do a perfect job of protecting campers from the elements and come with all sorts of extra features to extend their capabilities. They are still very much multi-purpose, but are much better than the others when it comes to overall protection and quality. These tarps can be specialized for tent use, such as the Eno Eagles Nest Outfitters HouseFly Rain Tarp, which make them incredibly efficient for cold weather camping. Many of them are versatile enough to be used as ground tarps, as well as hammocks or shelters. The way these tarps are built allows for numerous different configurations so you can make the most of any campsite. There are many videos dedicated to the art of tarp origami, teaching viewers how to build some impressive structures with relative ease. A tent tarp is an exceptional piece of gear and is recommended above all others if you plan on taking on more than just picnics or a day at the beach. Most dedicated campers will favor a tent tarp, but the ultimate choice is all up to personal preference. Choosing the right tarp for your camping needs can take a little planning, but doesn’t have to be difficult. After learning what to look for, you are one step closer to being able to make the right decision when the time comes. An all-rounder is probably going to be your best bet, as it will suit just about any situation, but the choice is ultimately up to you. The Chill Gorilla 12’ Tarp is by and large the best tarp for any situation. Its durability and versatility speak for themselves. Providing complete protection from both the sun and the rain, it is even lightly insulated to cover some cold weather excursions. If you’re looking for a tarp that will outperform and outlast the competition, look no further than the Chill Gorilla 12’. Please share this article with anyone you know who is looking for a good tarp for camping.